Hello my name is Annie Thompson and I live in Skirling, a small village in the Scottish Borders close to the border with South Lanarkshire. I am an artisan flower grower selling beautiful seasonal, scented and fresh British home grown cut flowers for any, and all occasions including birthdays, christenings, weddings, anniversaries, corporate events and memorial/funeral flowers. The garden here has evolved over the years since we moved here in 2003. 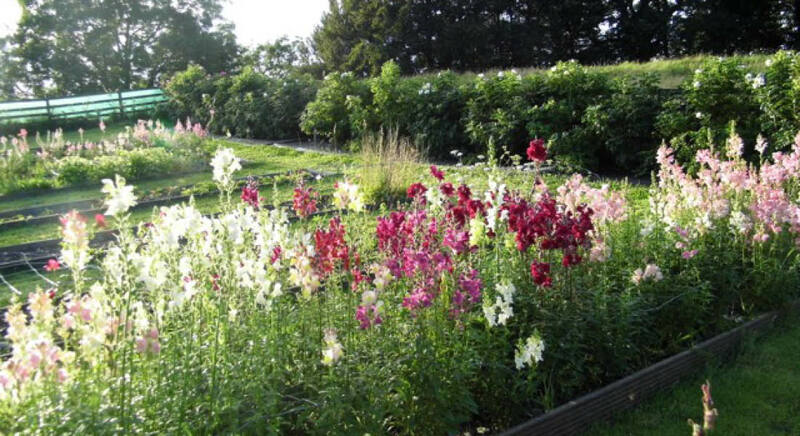 I started growing flowers for cutting and arranging in 2014 on about 1/3 acre, however I am using more and more garden for cut flowers, you can never have enough! Our seasonal flowers, foliage and herbs are available from April through to October from the garden here although I can, when required, also source British grown flowers from other suppliers around the country. The majority of the flowers used in our floristry are grown here in the garden with a rustic and natural style and straight from the garden feel with lots of scent. The variety of flowers we grow from both the cutting garden and polytunnel offers a colourful, vibrant and country cottage nostalgic feel. Your flowers will be unique to you and quite different to those available on the High Street. The seasonality of flowers means there is an ever-changing bounty. In spring the autumn planted bulbs are pushing their heads out into the cold earth with wonderful anemones, ranunculus, hyacinths, then come the tulips in a myriad of colours and textures, some frilly, some scented. Behind the scenes there is always seed sowing and planting out to herald the start of summer with cottage garden favourites including sweet peas with their heavenly scent, cornflowers, love-in-a-mist, poppies, roses, peonies, annual grasses which bob and sway and light up a bouquet of flowers. Towering spikes of blue delphiniums and fragile cosmos sit alongside herbs including rosemary and mint. As the summer gives way to autumn the garden takes on a different colour scheme with dahlias being the star of the show in all colours from white and cream through to apricots and deep dark reds and plums.